Avatar Aspect is the third stage of Samira's magic mastery over her spirits. She can now take on aspects of them and the gods/goddesses they originate from for additional power and abilities. However, it is not for every spirit. Only the two strongest of spirits from her ancestry have a strong enough link to activate at this point in time. A god that represents light and rebirth, and another that represents darkness and chaos. The third, while not of her ancestry origin, is that of her Zodiac Key, Sagittarius. A spirit that is an in between where alignment is concerned and also one of the 12 most powerful spirits the world knows. The other side of the magic is Samira being able to access weapons, armor, and items from her other spirits in the form of re-quip. With these two types combined, it makes Samira more useful and lethal when fighting alongside her spirits. Much like with her main magic, this one has a variety of spells to aid in most scenarios. A jack of all trades type of magic when it comes to offense, defense, and support. Incarnate - Passive. The trials and obstacles Samira has overcome has increased her magical power and link with her god incarnation spirits to extreme limits she never saw herself ever reaching. She is no goddess of any kind, but the levels of her magic has made her very similar to a lesser version. Because of this, she transcends the limits and laws set by non-magical areas. Samira is able to use her magical abilities regardless of being in areas that shut off magic entirely. Examples being Truth lineage and Neutral Grounds. Additionally, Samira has more control over her own power and is capable of toggling any of her buffs on and off, as well as hide her own magic aura if necessary whenever she is not using a spell. Blessing of Protection - Passive. Samira takes 50% less damage from all magical sources and types of magic, and the strength of her magical shields and barriers are increased by 10%. Celestial Oath - Passive. The link between Samira and her spirits is stronger than ever. Whenever a spirit is summoned in some form, the power of both spirit and summoner is amplified. Spell damage is increased by 60%. As another effect to the stronger bond between herself and her spirits the magic that links them all together allows for the un-summoned spirits to aid Samira by granting her 5% HP every post. Samira can choose to heal herself or a nearby spirit for the equivalent of S rank damage, as well as remove one negative status effect. This can be done once per post. Now being able to use the powers of Apophis even more so than before, Samira can use another one of his abilities in a weaker form. She can erase her own physical existence as well as her magic aura as a form of invisibility. If broken prematurely, Samira can enter this state again on the next post. Samira uses the energy of her spirits of light to become that herself. Her speed greatly increases to 100 m/s as she performs a quick moving dash anywhere within 100m once per post. Small amounts of linen mummy wrappings cover Samira's body, giving her additional abilities that allows her to use them magically for control and defense. Active: Healing Wraps - The wraps that cover Samira provide a healing benefit and continuously replace themselves when damaged or torn after this ability is activated. She is healed for the equivalent of B rank Spell Damage once per post throughout the duration of this Re-Quip. This also gives her a 60% buff to healing spells. Active: Mummification - The wraps unwrap from Samira and extend towards targets within a 100m range at a speed of 50 m/s. If necessary the wraps will create more of themselves in order to go after all targets. If a wrapping manages to reach a target the wrapping will then cover and trap its target to immobilize them for a single post. This can be done every post of the Re-Quip's duration, however, it can only trap those that have already been immobilized every other post. Also does 50% of B Rank spell damage to each target captured, as well as debuffs the power of their healing spells by 60% for 6 posts. The debuff does not stack with each hit, but can be re-applied if removed. Five powerful crystals that swirl around and hover around the one that summoned them. Each is a different color, representing a different element. They are harmless to others though and only suit to provide more power for Samira. Passive: Crystalized Magic - The crystals boost Samira's Magic Damage by 55%. Passive: Lamia's Swiftness - The crystals boost Samira's Speed by 55%. A spear that is made of solid ice and has a frosty mist around it. It is also cool to the touch. Active: Icicle Storm - A ring of frost is created in an area as far as 50m away from Samira, of which the edges of the ring expand to be the size of 100m. Those within become frozen for 1 post if they do not leave the ring and will also suffer 50% of A Rank spell damage from icicles that start raining down. Being hit by the icicles or becoming frozen leaves a debuff that lowers movement speed by 65% for 7 posts. Can be used every post, but the frozen effect only triggers every other post for those already affected. Active: Frigid Blast - From the spear Samira can fire an ice beam that goes as far as 300m at 300 m/s towards a single target to inflict full A rank spell damage. The beam will also freeze the target in a block of ice to immobilize them for 1 post. This ability can be done every post of the Re-Quip's duration, but those that have already been frozen can only be affected by the freeze every other post. A katana that glows with bright light and gives Samira extra speed and another way to attack. Passive: Light's Speed - Samira's speed is increased by 50% whenever she is holding this weapon. It also shines with bright light, making it the perfect night light or flashlight. Active: Radiant Dance - Samira's speed temporarily increases to 165 m/s and with the sword she will attack any enemy within a 225m range multiple times. Each strike does 75% of A rank spell damage. After the attack, a 65% speed buff is placed on Samira that lasts for 7 posts. This can be used every post but the buff does not stack. It can, however, refresh it if Samira has been debuffed. Armor that doesn't look very protective overall, but does come with defensive abilities. Passive: Goddess Aid - Throughout the duration of this Re-Quip, Samira is healed for the equivalent of S Rank Spell Damage once per post. Active: Reflect Imprisonment - When activated, every post throughout this Re-Quip's duration Samira is able to reflect a single spell back at its original caster. This requires twice the amount of MP that was used to create the enemy spell in order for it to be successful. However, if the reflected attack hits its original caster they will also become trapped in a small jail made up of clear energy shields. The person trapped is free to move and cast their spells as normal within the jail since they are not stunned or immobilized. Even the prison walls themselves do no damage. Still, the walls take 2x S rank Spell Damage in order to break unless the enemy has a spell or ability that is S rank or above to get through it, such as a teleport. The energy shields also benefit from Defensive Spell buffs. B+ Rank Passive: Defensive Aura - This increases the power of Samira's defensive spells and abilities by 80%. 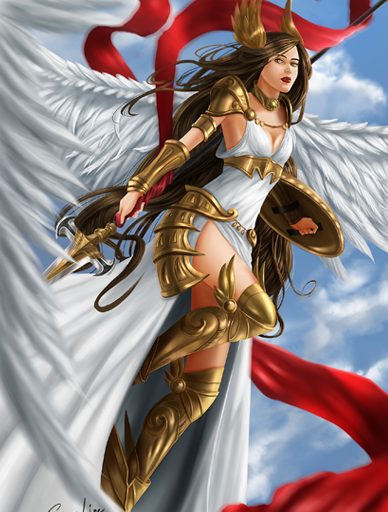 A Rank Active: Goddess' Wings - Large white feathered wings appear on Samira's body when this ability is activated. It allows for flight to whatever height for plot, but for pvp combat they stay within the 75m and 75 m/s burst values. While the movement speed may seem like a teleport, it is not one and therefore will not be affected by spells and abilities that interrupt or cancel out teleportation spells. The wings can also be used to block up to 2x A rank's worth of spell damage every post throughout this Re-Quip's duration. A bow that has magical properties, and is more powerful than the lesser bow that the Mark of Sagittarius gives her. The standard arrows generate magically and automatically, and follow burst range and speed of 100m and 100 m/s. Active: Arrow Upgrade - Upon activation, the standard arrows are replaced by a different type for 10 posts. The arrows of this bow drain 5% of MP from those hit and also apply a debuff that lowers the power of their Defensive Spells and Abilities by 60%. The drain can only happen once per post per target, and the debuff does not stack. 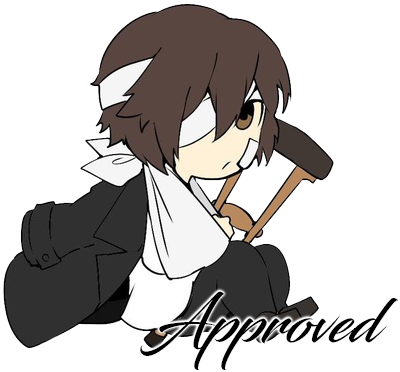 It can, however, be reapplied if removed and the target gets hit again. Active: Star Arrow - A single sparkling shot is released from the bow and heads towards a target as far as 400m away at 400 m/s. It is capable of doing S rank Spell Damage as well as leaving a debuff on the target that increases the cost of their spells and abilities by 50%. This ability can be used once per post throughout the duration of the Re-Quip. However, the debuff does not stack. It can be reapplied if it is removed and the target is hit again, though. 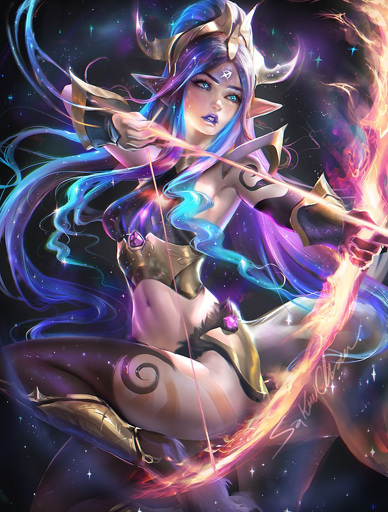 B+ Rank Passive: Archer's Eye - The Range of Samira's spells and abilities from magic and equipment are increased by 45%, and the damage is also increased by 45%. 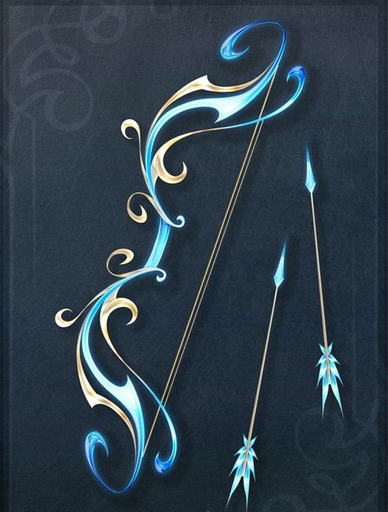 A Rank Passive: Image of Sagittarius - A duplicate bow is created when the Grand Bow of Sagittarius is used. There appears to be no one actually wielding it, and the weapon acts on its own accord. It attacks targets that are within 225m range at a speed of 165 m/s with magic arrows. However, these shots only do 75% of A rank Spell Damage, and it can only attack in a frontal cone. The direction of the cone can change once per post. Large falcon wings appear on Samira's back covered in bright sunfire. They are hot to the touch, but do no more damage than being slapped around by them. Active: Hot Flash - The wings allow her to fly, of course, but that is a secondary function. Their main power allows her teleport as far as 100m. Whenever she disappears and then reappears, waves of sunfire erupt from those locations, doing A rank Spell Damage to anyone within melee range. Can be used once per post during the duration of this TO. Samira's normal nails are replaced by sharper variants that are as strong as the strongest metal and are of a golden color that flicker with the sun's energy. Active: Solar Flare - A simple attack that blasts a target with a small amount of sun fire that does A rank spell damage. Goes as far as 300m at 300 m/s. Can also be used as a melee attack version if someone is close enough to be swiped. Once per Post throughout this Take Over's duration. When using this spell, the power of Ra comes to her through her eyes. Their verdant color turns into a fiery glowing mixture of red, orange, and yellow as if they were mini suns. Active: Searing Sun - Beams are shot through both of her eyes, going as far as 225m meters at 165 m/s. The hot temperature of the beams is quite harmful and will damage anything it hits with severe burns for 75% of A rank spell damage. As another effect, the beams can also pass through armor, shields/barriers, and walls to do 50% of their normal damage. She can continue to release these beams until the full duration of the Eyes of Ra is complete. Despite its name it isn't an actual sun. This more or less means his magical energy as a copy of the sun god. To reflect it, Samira's hair and skin will become bright and has the intense coloring of the sun itself. Mini solar flares and eruptions of energy on her body can also be seen during the duration of this spell. Active: Supernova - The energy within Samira will cause an explosion with her at the center. The extreme heat and sunfire will travel as far as 150m at a speed of 75 m/s. The damage caused to all in the explosion's path will receive 50% of A rank Spell Damage, and the energy will continue to release and deal that same damage every post during the duration of Sun of Ra. As an additional effect, the energy that was released makes room for a higher class of energy that gets rapidly generated. Her magical and physical attacks now do 32.5% more, and are capable of piercing through armor as well as barriers/shields to do 50% of their intended damage. The buff lasts throughout the rest of the duration of this TO. All partials come together to turn Samira into someone that has many appearance qualities of a bird such as the wings and even her nails extending as if they were talons. The appearance effects of each partial still remains and her entire body radiates the brightness and intensity of the sun. The Aspect of Ra focuses on a speedy offensive with some supportive abilities. Passive: Restoring Light - The energy coursing through Samira as soon as she uses this take-over will begin to heal her for 50% of the equivalent of S rank spell damage per post until it caps at 2.5x S rank spell damage. If she has a DoT effect on her when first using the full take over of Ra then it will be cleansed and removed if the spell that put it on her is of equal or lower ranking. As a final effect, spells and abilities that cut her resource regeneration are 50% less effective against her while she is in this form. Should they be cut off before taking this form it will restore them at half power. Active: Daybreak - From Samira a great surge of sunlight covers the area around her, extending at a max range of 200m at a speed of 100 m/s. This ability eliminates all shadows and darkness in the area, including magical ones of equal or lower rank. However, only one user-registered spell is eliminated at no cost. For any others that are present upon activation, the MP that was used to create the spells must also be paid in order to work against them. Furthermore, if extra MP is spent, the ability will negate and eliminate a darkness spell of equal or lower rank every post. The MP cost to do this must match what it cost to create the spell based on its rank. 50% of S rank damage will also be done towards those within the area every post for the rest of the duration of the TO. Samira will connect with the magical energy of this summon and a part of him will appear on her form, giving her access to his power temporarily. This partial manifests within her eyes. They shift to a glowing purple color, reflecting his dark chaos energy. Passive: Enhanced Vision - Unlike the poor eyesight of many normal snakes, the eyes of Apophis do not have such a weakness. Samira's eyesight is instead enhanced beyond their normal human capabilities, allowing her to see small details very clearly as far as 75m away even if there is a natural barrier such as smoke or fog that would otherwise prevent it. With the spirit being a copy of a god of darkness, she is also able to see in the dark and track heat signatures with infrared vision. As a final effect, this ability allows her to see through walls of all types. If it is a magical wall, then the MP that was used to make that spell must be spent before she can see through it, and only works on spells and abilities that are A rank or lower. 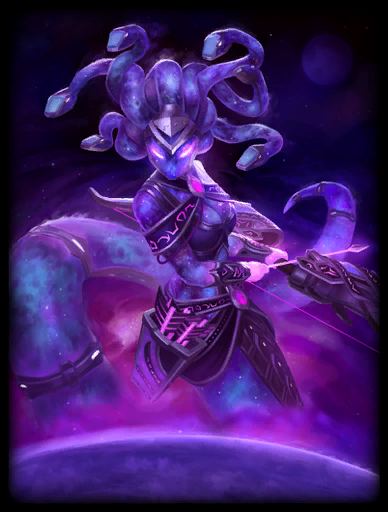 Samira's skin turns a purple color and becomes covered in soft scales that have a mist-like energy radiating from it. Active: Nonexistence - An ability where Samira can erase the existence of objects and living creatures. She can either touch whatever it is she wishes to erase, or cause the magic to blast out from her body and spread in a circle 100m around her at 100 m/s. OOC permission is required for the erase part of the spell to effect players, pets, equipment, and anything else player owned. Otherwise the spell itself will do S rank spell damage. Can be used every post during the duration of this TO. Taking on another part of Apophis, Samira's blood is replaced with the same magical type as his. It creates a purple mist-like aura around her that is harmful to most. Passive: Chaotic Energy - The properties of the energy in her bloodstream is actually harmful to all but herself and spirits. Whether by entering the range of the aura itself or by touching her blood S rank spell damage will be done. This can happen for each post someone meets one of those conditions. The effect of the aura and blood also places a debuff, paralyzing those within range or by touching for 1 post. Once free, the paralyzing can happen again every other post. A snake spirit is nothing without its tail, and so naturally it is a big part of the overall take over. Samira now has a long serpent tail whenever this spell is used. This does not replace her actual lower half to make her similar to a lamia. Active: Chains of the Void - Snake-like moving chains made out of dark energy will travel as far as 300m at 225 m/s and attempt to wrap around several targets, trapping them and making them unable to move for 1 post. The energy chains will remain to trap any new enemies that enter the battlefield, although those that have already been trapped can only be so again every other post. Enemies will also be damaged for 75% of S rank damage per hit if they are struck by a chain. Duration of 10 posts. When used all partials combine to transform into a creature like the one above. She becomes similar to that of a lamia but made of dark energy. The form and its partials make her stronger physically and the abilities themselves focus on darkness with some support and debuffing and enemies. Active: Cataclysmic Void - Dark energy will surround the user and spread as far as 400m at 250 m/s. The environment darkens, and the sun, stars, and moon will be covered entirely. Light magic of equal or lesser rank will also be consumed by the darkness during the initial activation. For clarity, only one light spell can be consumed with no MP cost. Any others that are present upon activation of this ability can only be removed if the proper MP that was used to create them is paid. Also, every post after the initial activation MP can be spent to strengthen the dark energy and consume light spells again so long as the MP cost matches the rank of the consumed spell. Those within the AoE range will take 50% of H rank damage, and will continue to take that same damage for every post they remain in it throughout the duration of the TO. During the ability's duration, a large and dark swirling portal will appear on the ground in front of Samira and will begin to draw everything around it in. Anything within 300m of the portal will have their speed slowed by 75% except for Samira. Duration of 20 posts. Active: Snake of Chaos - A large snake made up of dark energy is created and travels towards a single target as far as 600m away at a speed of 450 m/s, doing H rank damage upon colliding with its target and turning into energy particles. Getting hit by the attack also leaves a curse on the target. For 20 posts the affected target will take 75% more damage from spells. The damage part of this ability can happen every post of this TO's duration, but the debuff does not stack or reset the duration unless it has been removed or expired. Like the other Aspect spells, Samira's green eyes are replaced entirely. This time with a pale blue coloring that also shines as if they were stars. Active: Knowing Eyes - Samira's new eyes glow softly with the activation of this ability. This allows her to be more focused and always aware of the location of the target. Even when not looking at them Samira will be able to see anyone that is around or behind her unless they are using an ability that is of a higher rank to hide themselves. As an additional effect she has no need to blink. However, once per post she can blink and turn into a collection of mini stars that teleport up to 75m away at 75 m/s. This ability lasts throughout the duration of this Takeover. Active: Stunning Shot - Samira can summon a single celestial arrow and aim at a single enemy as far as 300m with a speed of 300 m/s. It does full B+ rank damage and stuns the target for one post. The spell and damage itself can be done every post of this TO's duration, but if hitting the same target the stun will only occur every other post. When this ability is used an aura around Samira appears, sparkling and twinkling like tiny stars. Passive: Chiron's Touch - The mini stars are for more than just looks. They increase the magic damage of Samira by 90%, and anything Samira touches with physical contact will be healed by 25% of A+ damage once per post. Samira's shoes and feet are replaced to appear as hooves from a horse/centaur. This does not replace her entire lower half to be a complete centaur. Active: Centaur's Stomp - Samira stomps the ground once, sending out a force of energy that expands as far as 112.5m at a speed of 110 m/s, dealing A+ spell damage and knocking enemies within the area back until they reach that distance. She can continue this once per post for the rest of this TO's duration. All partials combine and transform Samira to look like the picture above. In this form she represents a spirit of a Zodiac as well as Chiron. Focus on magic damage as well as some healing and support. Active: Starburst - The mini stars that make up the original aura of the TO multiply and spread around with Samira at the center, going as far as 300m at 150 m/s. At first they all appear to be harmless, but as soon as all the stars are in position they start a chain reaction of mini explosions that damage enemies around them for 50% S+ damage. Every post after the initial activation the stars will multiply and fill the area again for the same effect. Being hit by the mini explosions or entering the affected area that now swarms with the leftover tiny energy particles brings about a different effect. Enemy spells cost 50% more MP to cast and their spell damage is decreased by 55%. The debuff duration lasts for 12 posts unless removed, in which case the debuff can be re-applied if an enemy gets damaged again or enters the affected area. Active: Celestial Artillery - Celestial arrows appear above and to the sides of Samira just before heading out into the battlefield like shooting stars. They are all able to travel as far as 450m at a speed of 340 m/s, and each do 75% of S+ rank spell damage. This continues every post throughout the TO duration after activation. Also once per post, a few of the summoned celestial arrows can combine their energy to form a barrier that covers the front side of Samira to block damage equaling to 1x S+ rank damage. Duration of 12 posts. A rift is torn between the normal realm and the celestial realm when this ability is activated. The rift spreads as far as 600m and opens up a new realm that belongs solely to Samira's spirits. While in range of this opened rift, those that are not allies of Samira have their magic damage decreased by 115%. Additionally, her un-summoned spirits are gathered around as if spectating the fight. They can be called upon to enter the fight in order to negate a single spell up to H+ rank. The first negation is free, but after that Samira must use the same amount of MP that was used for the enemy to cast their spell in order for the negation to work. The final effect is that while in the rift 50% of H+ damage will be done to those that remain in range. The damage and the negation can be done once per post. The debuff can also be removed, but should an enemy get within range of the rift again the debuff will be added back on. However, it does not stack with each post or inflicted damage. -In UA, Blessing of Protection, reduced Defense buff so the total is for the Passive S rank number instead of Passive H rank. -In UA, Celestial Oath, reduced buff so it's a Passive S rank number instead of Passive H rank. The rest remains the same. -Celestial Oath and Blessing of Protection UAs were already approved here. I just moved them from my primary magic to here due to rule changes. No edits have been made to them. -As far as the spell functions, the Aspect spells were already approved here but with new magic rules I moved them from my primary to this third magic. The only edits I have made to them was to increase their ranks and the numbers to match, so speed, range, damage, buff/debuff numbers. Blessing of Protection - Passive. Samira takes 50% less damage from all magical sources and types of magic, and the strength of her magical shields and barriers are increased by 15%. Celestial Oath - Passive. The link between Samira and her spirits is stronger than ever. Whenever a spirit is summoned in some form, the power of both spirit and summoner is amplified. Spell damage is increased by 65%. As another effect to the stronger bond between herself and her spirits the magic that links them all together allows for the un-summoned spirits to aid Samira by granting her 5% HP every post. Samira can choose to heal herself or a nearby spirit for the equivalent of S rank damage. Now being able to use the powers of Apophis even more so than before, Samira can use another one of his abilities in a weaker form. Once per post she can erase her own physical existence as well as her magic aura as a form of invisibility. Samira uses the energy of her spirits of light to become that herself. Her speed greatly increases to 100 m/s as she performs a quick moving dash anywhere within 100m. Active: Wrap Negate - The wraps are able to unwrap from Samira and negate a single spell that comes towards her so long as it is of equal rank or below. Once per post and will take the same MP as the negated spell from Samira after the first negation. Active: Mummification - The wraps unwrap from Samira and extend towards targets within a 100m range at a speed of 50 m/s. If necessary the wraps will create more of themselves in order to go after all targets. If a wrapping manages to reach a target the wrapping will then cover and trap its target to immobilize them for a single post. This can be done every post of the Re-Quip's duration, however, it can only trap those that have already been immobilized every other post. Also does 50% of B Rank spell damage to each target captured. Active: Icicle Storm - A ring of frost is created in an area as far as 50m away from Samira, of which the edges of the ring expand to be the size of 50m. Those within become frozen for 1 post if they do not leave the ring and will also suffer 50% of B Rank damage from icicles that start raining down. Can be used every post, but the frozen effect only triggers every other post for those already affected. Active: Frigid Blast - From the spear Samira can fire an ice beam that goes as far as 200m at 200 m/s towards a single target to inflict full B rank spell damage. The beam will also freeze the target in a block of ice to immobilize them. This ability can be done every post of the Re-Quip's duration, but those that have already been frozen can only be affected by the freeze every other post. Passive: Extra Defense - A strong set of armor not only in the way that it is built but also magically. It comes with a small barrier that absorbs 3x B rank damage. Does not renew once broken. Active: Shield Reflect - When activated, the armor will generate an energy shield in front of Samira in order to reflect a single spell coming her way up to B rank. This will send the attack right back at the caster. The first use of this ability requires no MP cost, but for every reflect after the same amount of MP that was used to create the enemy spell must be spent in order for it to be reflected. Can be used once per post. Passive: Crystalized Magic - The crystals boost Samira's magic damage by 50%. Passive: Lamia's Swiftness - The crystals boost Samira's speed by 50%. A golden and thin circlet with an eye symbol at the center. Looking pretty isn't its only function, however. This accessory provides healing for its wearer and damage for enemies. Passive: Sun's Restoration - This item will heal Samira for 50% of the equivalent of B rank spell damage once per post as long as she has it equipped. Passive: Solar Flare - This item has an intense heat aura that spreads as far as 50m and will damage those for full B rank spell damage once per post. Active: Radiant Dance - Samira's speed temporarily increases to 165 m/s and with the sword she will attack any enemy within a 225m range multiple times. Each strike does 75% of A rank damage. After the attack, a 60% speed buff is placed on Samira that lasts for 7 posts. This can be used every other post but the buff does not stack. Active: Hot Flash - The wings allow her to fly, of course, but that is a secondary function. Their main power allows her teleport as far as 50m. Whenever she disappears and then reappears, waves of sunfire erupt from those locations, doing B rank damage to anyone within melee range. Can be used once per post during the duration of this TO. Active: Solar Flare - A simple attack that blasts a target with a small amount of sun fire that does B rank spell damage. Goes as far as 200m at 200 m/s. Can also be used as a melee attack version if someone is close enough to be swiped. Once per Post throughout this Re-Quip's duration. Active: Searing Sun - Beams are shot through both of her eyes, going as far as 225m meters at 165 m/s. The hot temperature of the beams is quite harmful and will damage anything it hits with severe burns for 75% of A rank spell damage. As another effect the beams can also pass through armor, shields/barriers, and walls as long as the equal amount of MP is paid in order to pass through a defense. This cost is per beam. She can continue to release these beams until the full duration of the Eyes of Ra is complete. Active: Supernova - The energy within Samira will cause an explosion with her at the center. The extreme heat and sunfire will travel as far as 150m at a speed of 75 m/s. The damage caused to all in the explosion's path will receive 50% of A rank damage, and the energy will continue to release and deal that same damage every post during the duration of Sun of Ra. As an additional effect, the energy that was released makes room for a higher class of energy that gets rapidly generated. Her magical and physical attacks now do 32.5% more, and are capable of piercing through armor as well as barriers/shields if the same amount of MP that was used to create the defense is paid. This cost is per attack that goes through the defense. The buff lasts throughout the rest of the duration of this TO. Passive: Enhanced Vision - Unlike the poor eyesight of many normal snakes, the eyes of Apophis do not have such a weakness. Samira's eyesight is instead enhanced beyond their normal human capabilities, allowing her to see small details very clearly as far as 300m away. With the spirit being a copy of a god of darkness, she is also able to see in the dark and track heat signatures with infrared vision. As a final effect, the magic within them allows her to vanish from existence and re-appear 75 meters away at 75 m/s once per post. Active: Nonexistence - An ability where Samira can erase the existence of objects and living creatures. She can either touch whatever it is she wishes to erase, or cause the magic to blast out from her body and spread in a circle 75m around her at 75 m/s. OOC permission is required for the erase part of the spell to effect players, pets, equipment, and anything else player owned. Otherwise the spell itself will do A rank spell damage. Can be used every post during the duration of this TO. Active: Chains of the Void - Snake-like moving chains made out of dark energy will travel as far as 300m at 225 m/s and wrap around several targets, trapping them and making them unable to move for 1 post. While targets previously may be immune to getting trapped again, the dark chains will remain to trap any new enemies that enter the battlefield. For those that have become immune to the effects, they will instead be damaged for 75% of S rank damage per hit if they are struck by a chain. Duration of 10 posts. Passive: Knowing Eyes - The eyes of Sagittarius are focused and always aware of the location of the target. Even when not looking at them Samira will be able to see anyone that is around or behind her unless they are using an ability that is of a higher rank to hide themselves. As an additional effect, they allow her to see the magic energy of other mages. Lastly, once per post she can blink and turn into a collection of mini stars that teleport up to 75m away at 75 m/s. what the hell's going on, can someone tell me please? why i'm switching faster than the channels on tv? Unlocked and moved at user's request. Ello Samira! Always a pleasure. Your magic is near perfect, as usual, but I have a small edit for just your Grand Bow. All edits will be in this color. B+ Rank Passive: Archer's Eye - The Range of Samira's spells and abilities from magic and equipment are increased by 45%, and the damage is also increased by 45%. Ranges can only be increased through the usage of downsides. If you want to increase your range, something else must be debuffed by an equal or greater percentage. Hey, Leah! Thank you for taking the time to look at my magic as always ^^ However, that rule is not actually true anymore. I once thought that as well due to what it says in the rules, but it has never actually been applied once former staff got the boot and were replaced. I suggest getting on mod chat or asking Johann about it because myself and others have been getting spell speed and spell range increases without the use of downsides in items as well as magic. Edit: I went back to read the rules again and the downside rules were actually edited. Speed and Range are now just examples, which means they can be buffed as normal and downsides are now just used to buff anything beyond their normal parameters. Thanks for bringing it to my attention, Samira! It's being added to the rules to avoid future confusion.